25 "There will be signs in sun and moon and stars, and on the earth dismay among nations, in perplexity at the roaring of the sea and the waves, 26 men fainting from fear and the expectation of the things which are coming upon the world; for the powers of the heavens will be shaken. 27 "Then they will see THE SON OF MAN COMING IN A CLOUD with power and great glory. 28 "But when these things begin to take lace, straighten up and lift up your heads, because your redemption is drawing near." 29 Then He told them a parable: "Behold the fig tree and all the trees; 30 as soon as they put forth leaves, you see it and know for yourselves that summer is now near. 31 "So you also, when you see these things happening, recognize that the kingdom of God is near. 32 "Truly I say to you, this generation will not pass away until all things take place. 33 "Heaven and earth will pass away, but My words will not pass away." We are in the time of Advent, and this Sunday too we find a passage about Jesus coming. The time right before His coming, the actual coming, and the time after His coming. We will stop and look at the different incidents gradually. The time before His coming is described other places in the Bible as - and compared with - a womans birth pangs. This too tells us about something in this time, and how these signs which is described will turn out. Some of those things which tells us about the last days points to something completely new. Diseases, pests, epidemic which seems completely new and unknown, and in a huge scope. Human made nature catastrophes like dead rivers and oceans, landslide, draught etc. Wars of a scope and with weapon the world has not seen before. But the most that is described as signs, is not something new or unknown. It is things that have been here all the time, like landslides, volcanic eruption, bad weather, hurricanes, hail, draught etc., but it is here the sign is evident for His believers - in the picture about the birth pangs. We know how it unfolds. They start slow and with long intervals, and then increase gradually in both speed and strength, till there is no stop in between them. The forces of nature will be so far beyond normal, and cause such destructions and catastrophes that it will be as we read here: "- and on the earth dismay among nations...." (v.25b). The world will no longer appear as a pleasant place for anybody. What may astonish you in this context, is how people despite this will not turn to the Lord - God who has the power over these plagues (Rev. 16:9) - but clings to what they have, and blaspheme the name of God. They stick to the character and the attitude who has brought the world under this judgment, even if they - as we read - are fainting from fear and the expectation of the things which are coming upon the world. (v.25-26). These are strong expressions. When fear reaches a goal to where one faints, it is pretty special, because a human has in it to fight to survive, when it is in need. The instinct of self-preservation is a strong force in every life, also in a human being. A drowning human flaps all the way till the end. But here - faint! But turn to God? No! The things that particularly will cause this fainting is described as "powers of the heavens will be shaken." (v.26b). What has been standing firm and followed its course from the creation, is now in disorder. "The earth reels to and fro like a drunkard And it totters like a shack," says Isaiah 24:20. Man who have wanted to be like God, and in its incredible pride and arrogance have believed to be capable to master and undermine these powers, have now oneself fallen in their "hands", and get to see and experience to the full how small they really are. But now it is too late. It is like nature itself has had enough of man, turns away from it and wants to kind of shake it off. This, in principle Gods creation, man - the crown of the creation - but has shown to be so unworthy to the high position it was meant for. It has exploited and abused everything that can be exploited and abused. Listen to what the Lord says by Isaiah: "The earth is also polluted by its inhabitants, for they transgressed laws, violated statutes, broke the everlasting covenant. Therefore, a curse devours the earth, and those who live in it are held guilty." (Is. 24:5-6). This was the cause. And no green movement can do anything about it. Nature (creation) is on Gods side. It has not sinned, Paul says: "For the creation was subjected to futility, not willingly, but because of Him who subjected it." (Rom. 8:20). Now it wont carry this unworthy, rebellious and greedy creation anymore. Luther speaks like this about this subject. But it is drawing near - longs - that Gods children shall be revealed because then it will be set free from its slavery to corruption into the freedom of the glory of the children of God. (Rom.8:19-21). It is like it is tired of waiting, and wants to hasten the day. But right in the midst of this seemingly darkness the light shines just as clear. Yes, in reality this just inaugurates a broad daylight for Gods people. This happens while the world falls into powerlessness for the same thing, because they have in reality no foundation. Something that clearly is revealed in this. - And therefore His people are encouraged to straighten up and lift their head! (v.28). Only the one who are rightly certain of his victory will lift the head before an enemy, or a threatening situation. And that is exactly what Jesus tells us with this! He would never encourage us to do so, if there were any reason for doubt about the justice of it. Your (sing.your) redemption is drawing near! And how did Paul describe it? “The freedom of the glory of the children of God!” To us, these signs inaugurates: Summer! (v.30). This is the time immediately before His coming. It is going to be short from the time it breaks forth to the time it has reached its destination. The generations that exists as these apocalyptic signs starts to show, will not pass away until all things take place. (v.32). And then we move unto His coming. (v.27). Those who will go under shall see Him reveal Himself in the cloud with power and great glory. Think, Jesus, Him whom they mocked and scorned and ridiculed as they also did with witnesses who had tried to witness about Him for them. 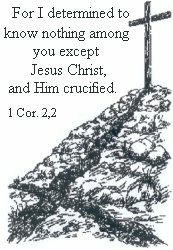 Now the roles has changed from the day on Golgotha - where He willingly let Himself be abused and killed for the sake of us all. But now: Him with power and great glory, they with powerlessness! He who had bore their sins on His body - and was so powerless that He was sweating blood - so that these could let go of these terrible consequences of sin; now He comes as their judge. But: To redemption for His own. And then at last: The time after His coming. Heaven and earth, in its present shape has ended, but not His Word. (v.33). Now it is on the contrary fulfilled. The promises have become reality for the believers, and will stand forever. His word will never pass away, as He says here. (v.33). If you could only get a little glimpse in this. The Word - the message and promise - you have heard, will never pass away. Let me say it like this: That is what never will pass away! Therefore: “Do not anxiously look about you.” (Is. 41:10).